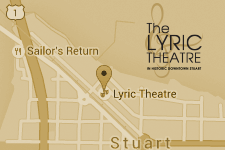 Tickets are available only by visiting the Lyric Theatre Box Office; seating is on a first-come, first-serve basis. The free tickets are limited to four per person and are subject to availability. Summer Box Office Hours are Monday thru Saturday 10am - 3pm and Two Hours Prior to Show Times. Humana, one of Florida’s largest Medicare health benefits companies with more than 1-million Medicare members statewide, is committed to helping our millions of medical and specialty members achieve their best health. Our successful history in care delivery and health plan administration is helping us create a new kind of integrated care with the power to improve health and well-being and lower costs. Our efforts are leading to a better quality of life for people with Medicare, families, individuals, military service personnel, and communities at large. For more information, visit Humana.com.